A Private Villa: The Perfect Romantic Getaway! Valentine’s Day is on my mind as I write this message today. When a couple plans a vacation to Virgin Gorda, they often think it simply is extravagant to choose a villa rather than a hotel room. After all, there are only two of them in their group. 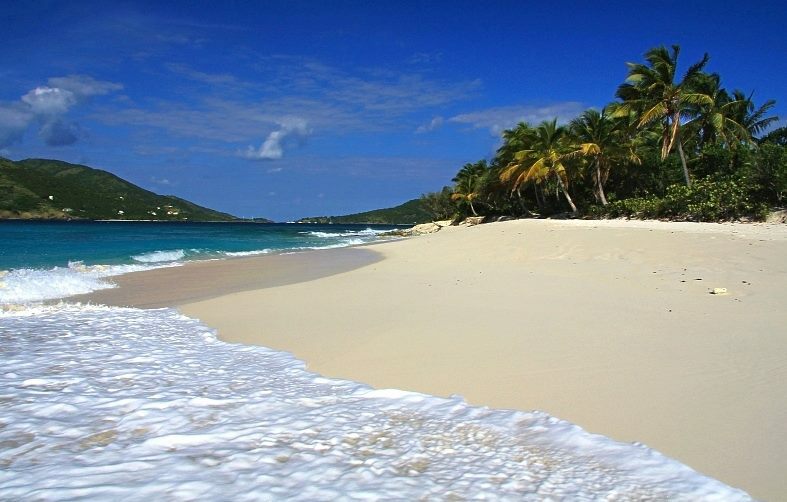 Finding your best beach on Virgin Gorda will become a favorite pastime during your vacation! In the past 15 years, I’ve rented my 6,500 sq. ft. villa, A Dream Come True Villa, to many couples celebrating their engagements, renewing their wedding vows, enjoying their honeymoons, baby moons, or “just because.” Let me explain how renting a villa may be the best choice for you. Many times I’ve helped nervous fellows plan where to pop the question on Virgin Gorda beaches. For one romantic gentleman, I hired a private chef to arrive at the villa in time to light candles throughout the Great Room, turn on the CD of music mailed by this guest in advance of his stay – everything accomplished before the newly engaged couple returned to A Dream Come True for their engagement dinner! My housekeeper, Germain, is an expert at making gorgeous bouquets for brides renewing their wedding vows at A Dream Come True. Sometimes these events are a surprise for the bride or the groom, and that adds to the fun! 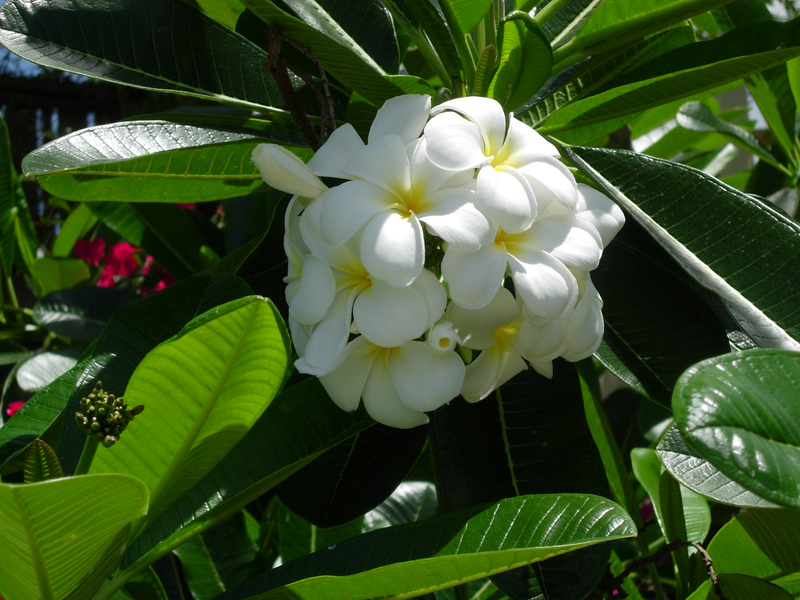 Plumaria, a heavenly scented flower, is one of more than 25 species of flowering plants and trees at A Dream Come True Villa. Many parents-to-be have enjoyed “baby moons” before little ones arrive; they love the maid service 7 days a week and pampering offered by our staff. I’ve come to think that couples that honeymoon on Virgin Gorda have the beauty of the island and the turquoise color of the water imprinted on their DNA’s. They often return, and they tell me they keep photos of ADCT villa as their screensaver on their computers until they can come for their anniversary. 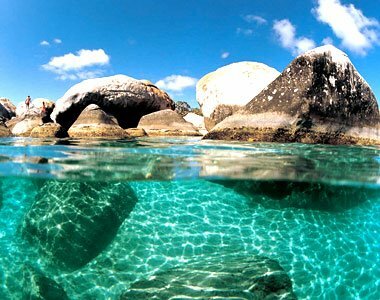 You can spend many delightful hours snorkeling amongst the boulders in Virgin Gorda. No matter how deluxe your hotel room, it is still a room with 4 walls. Once you leave it, your privacy is gone. In contrast, when staying at a private villa, you are free to move about your private world, enjoying views of beaches and islands. Enjoy views of Pond Bay Beach and Savannah Bay Beach ~ and kayak there in just 2 minutes from A Dream Come True Villa, a 5 bedroom oceanfront estate with exceptional privacy. You can laze by your own pool and skinny dip under the stars. Play your favorite music into the soft night air as you listen to the sound of the surf on the shore. What a joy it is to have your own villa ~ peace and privacy surrounding you. When comparing the cost of a hotel room to a villa stay, be sure to factor in the savings realized by preparing some of your meals at a villa. In addition, most villas have special rates for couples renting one bedroom, and you enjoy exclusive use of the entire property. 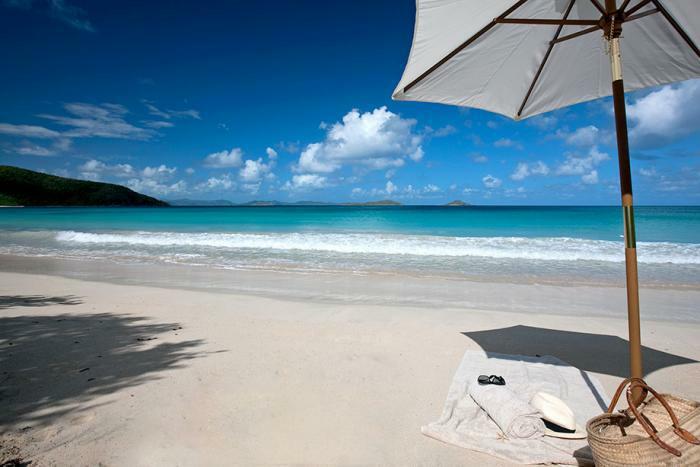 With 14 gorgeous beaches, Virgin Gorda offers an unrivaled opportunity to visit pristine locations. Often, you can be the only ones on the beach. How’s that for a romantic vacation? Between Thanksgiving, Black Friday, Hanukkah, Christmas, and other seasonal holidays, folks forget to plan for a winter vacation until February or March. That can be a mistake. Think about the benefits of a January vacation and the opportunity it offers to reflect on 2014 and recharge yourself for 2015. January seems to go better with a getaway! 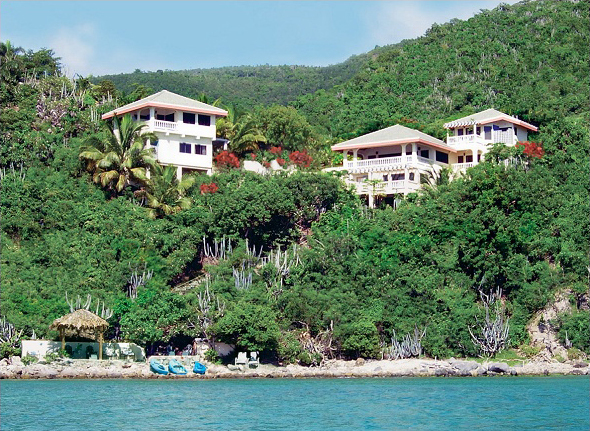 Move into another dimension while practicing yoga on your best beach in Virgin Gorda. 1. Winter airfares are often the lowest in January. Right now is the best time to search for a January airfare for a Caribbean vacation because airlines realize demand is less right after the December holidays. 2. Non-stop flights are available to St. Thomas, U.S.V.I. from January to March from many more U.S. destinations than in you’ll find in low season. 3. For January, Southwest Airlines has added San Juan to its destinations from many U.S. cities. Jet Blue has many non-stop flights to San Juan. 4. 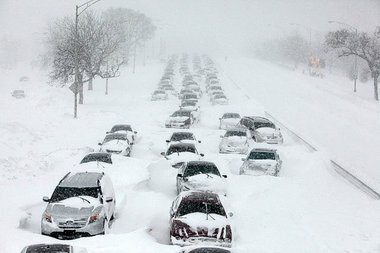 It sure seems like some of the worst winter weather in the U.S. occurs in January. Get out of town to where it is always warm and sunny! 5. You can depend weather in the high 70’s to 80’s every day in Virgin Gorda in January. Not so in Florida! Make some new friends in Virgin Gorda! 6. Lots of folks deal with the effects of Seasonal Affective Disorder (SAD) due to lack of sunshine, shorter days, and not enough color in their lives once winter arrives. Instead of gray, gray, gray, they need to see COLOR! Come swim in turquoise seas, relax on white talcum powder beaches, and soak in the visual beauty of vivid pink and purple bougainvillea, red hibiscus, white oleander and blue plumbago. 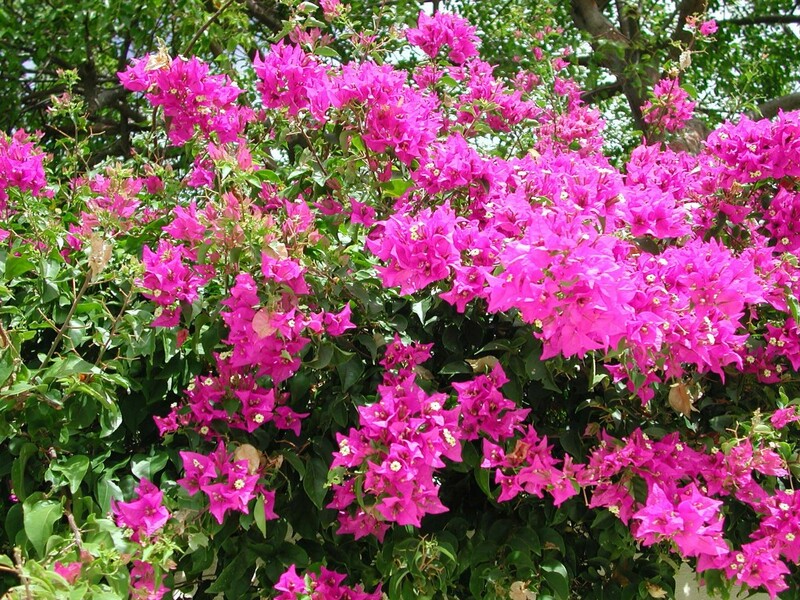 A Dream Come True Villa has more than 20 flowering plants and shrubs! 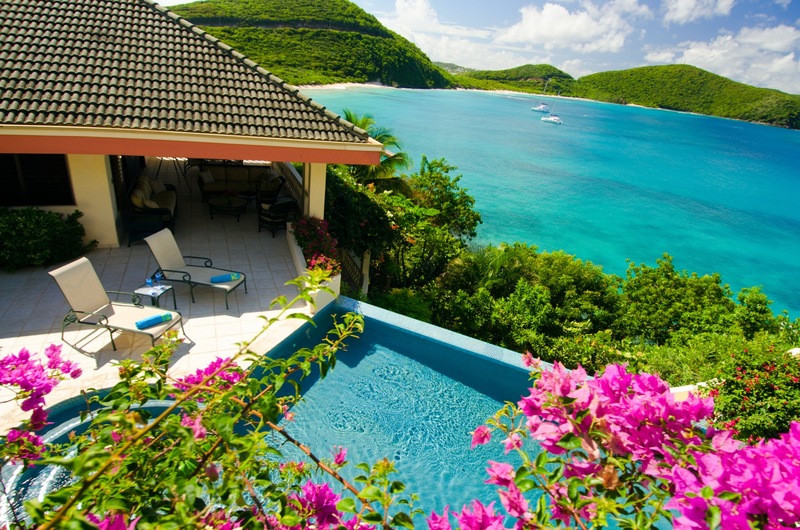 Vivid clusters of pink bougainvillea light up the landscape at A Dream Come True Villa on Virgin Gorda, British Virgin Islands. 7. Many vacation properties have January specials. 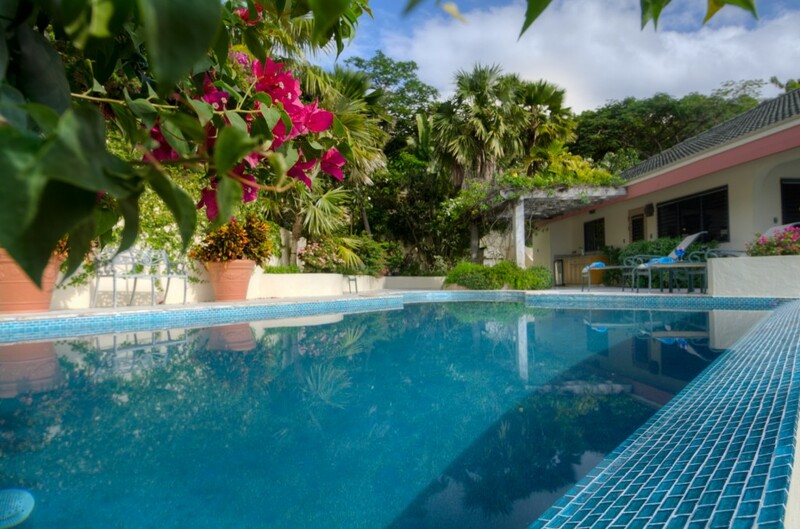 Come to A Dream Come True Villa, a vacation villa for rent in Virgin Gorda, and let us pamper you with a 25% discount off our Winter Rates from January 4 – February 7, 2015! 8. Staying at a private villa with 8 or 10 guests is an economical way to stretch your vacation dollars in January, and you’ll love the abundant privacy a villa affords. Look for a villa with fabulous ocean views! Perhaps you’ve never heard of this day dedicated to recognizing the sacrifice of those servicemen and servicewomen who have met the criteria for receiving this U.S. Military Award. All branches of our military award it. 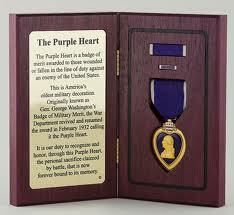 In order to earn a Purple Heart, you must be seriously injured in the service of your country. Too many Americans earned this distinguished honor while deployed in Iraq and Afghanistan. Due to roadside bombs, their severe injuries often meant losing an arm, or legs, sight, hearing or perhaps brain function. Too many acquired Post Traumatic Stress Disorder. Frequently, Purple Heart recipients are no longer medically fit to do the military jobs they were highly trained to do. They are honorably discharged and left to deal with ongoing rehabilitation and unemployment. “Though people may be tired of hearing about Iraq and Afghanistan, the aftermath for these wounded veterans and their caretakers is ever-present, and through donations of vacation homes, time shares and funds to sponsor these dream vacations, the American people are showing that they truly value the service and sacrifice of our military,” Peggy Carr said, founder of Vacations of Veterans. I am writing these thoughts Thanksgiving Week because I want to highlight two ways many Americans can give back to Purple Heart veterans. 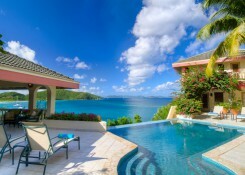 I own A Dream Come True Villa, an oceanfront, luxury villa for rent in Virgin Gorda, British Virgin Islands. I have been honored to give back to our heroes by hosting them for weeks of vacation at no cost. I do this through a wonderful organization whose sole purpose is to connect owners of second homes with Purple Heart recipients. The organization is called Vacations for Veterans. 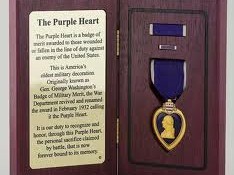 This is how it works: Homeowners donate a week at their vacation homes ~ at no cost ~ for a Purple Heart recipient to enjoy. The veteran and his/her family’s airfare are paid by Vacations For Veterans. If you do not own a second home, you can make a donation toward veterans’ transportation expenses. Sometimes it takes up to five years before an injured veteran has recuperated enough to travel. For many veterans, it is the first vacation the family has ever taken together. At A Dream Come True Villa, we’ve been privileged to host Purple Heart recipients once or more every year. I’ll mention one guest’s visit in detail: a Navy Seal who lost both legs. 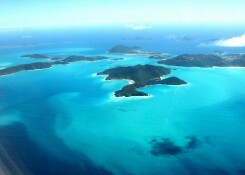 He visited Virgin Gorda with his two brothers and his fiancée. This remarkable young man’s main request was to go scuba diving as much as possible. 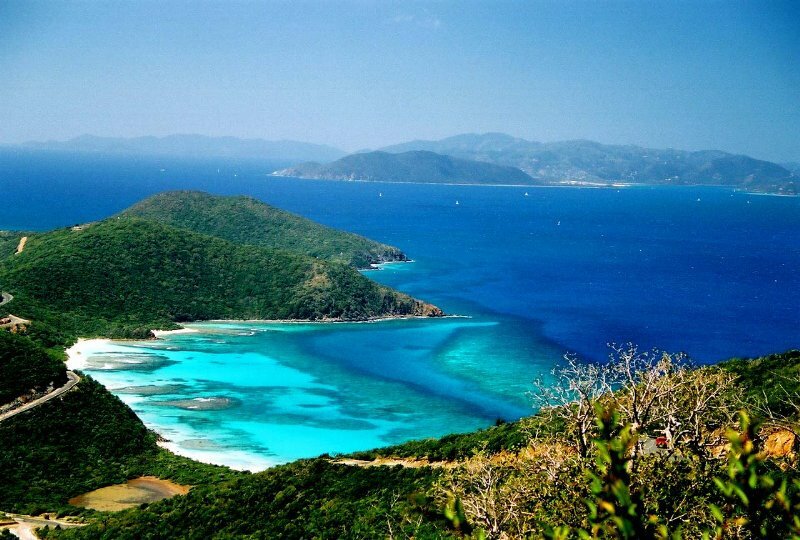 I wondered if this would be achievable, but I contacted DIVE-BVI on his behalf. The manager happened to be a Vietnam veteran, and he made this Purple Heart recipient’s Virgin Gorda dreams come true by taking him scuba diving every single day! This afternoon, our next Purple Heart veteran arrived at A Dream Come True. He faces a different set of challenges: 10 to 20 seizures a day caused by his injuries. 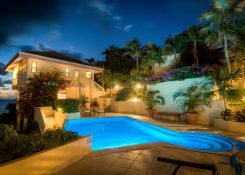 However, he is excited about trying to swim in the turquoise waters of Virgin Gorda and spending time relaxing at its pristine beaches. 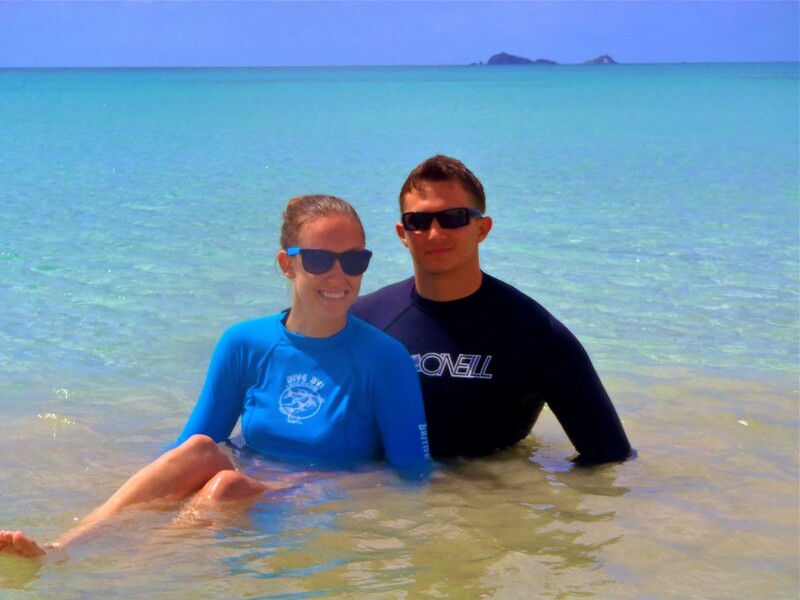 Vacations for Veterans paid for this veteran and his wife to fly to my island home. The turquoise waters at Mango Bay Resort are less than a 5-minute walk from A Dream Come True Villa. I encourage anyone with a vacation home to consider offering one week a year to this worthwhile cause. Over a hundred veterans have requested my villa at one time, so Vacations for Veterans puts it in a lottery for one lucky winner. There is a waiting list of Purple Heart veterans who served in Iraq and Afghanistan and are now healthy enough to go on a “Thank You” vacation. A week’s vacation at your 1-bedroom condominium in Florida or a cabin on a lake will bring enormous joy to a veteran and his/her family! If you do not have a vacation home, please consider making a monetary donation to cover travel expenses for a Purple Heart recipient and his family. The website for Vacations for Veterans is being redesigned and will be re-activated in January 2015, (vacationsforveterans.org) but in the meantime, you can contact Peggy Carr, the former Marine and founder of Vacations for Veterans, by E-mail at info@vacationsforveterans.org. Vacations for Veterans is a 501c charitable foundation. Your donations for travel expenses are tax deductible. Happy Thanksgiving, and God Bless! 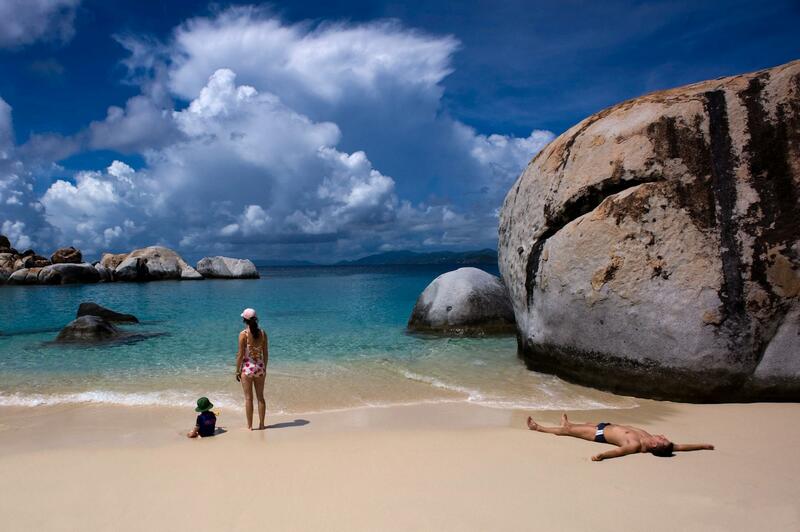 Find Your Best Beach For Swimming at The Baths National Park: Feel Like An Angel At Devil’s Bay! As I mentioned in another post, I advise my guests staying at A Dream Come True Villa to avoid swimming at THE BATHS where you’ll find crowds unless you time your visit at just the right time. Instead, take the trail leading from from THE BATHS to lovely Devil’s Bay Beach. Do this and you will feel like an angel at Devil’s Bay! 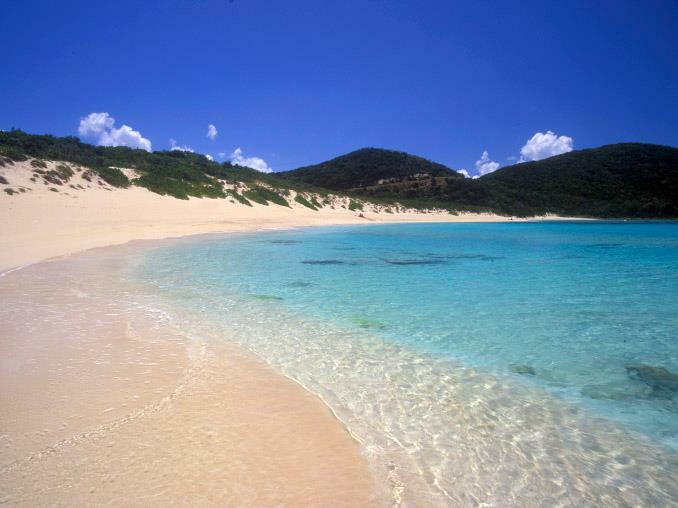 This beach is part of the BVI National Park System, but far fewer visitors frolic there. Note: You can also reach Devil’s Bay Beach by taking the trail directly from The Top of the Baths Restaurant parking lot. By the way, The Top of the Baths Restaurant serves a great lunch menu and sunset here is fantastic! 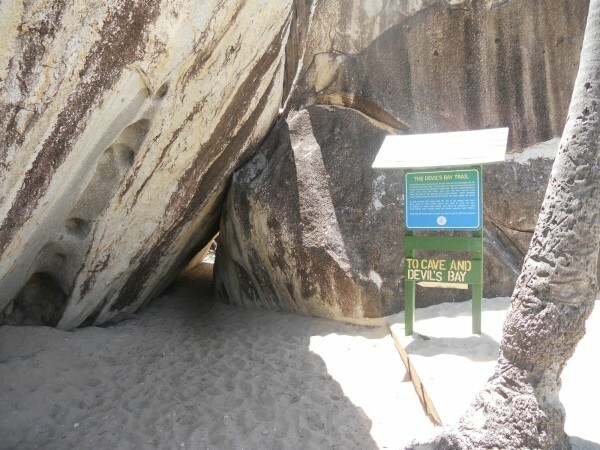 The direct path to DEVIL’S BAY is located uphill from their parking area. If you are following the trail to DEVIL’S BAY from THE BATHS NATIONAL PARK BEACH and need a snack, grab something before you leave because only THE BATHS offers a snack bar. 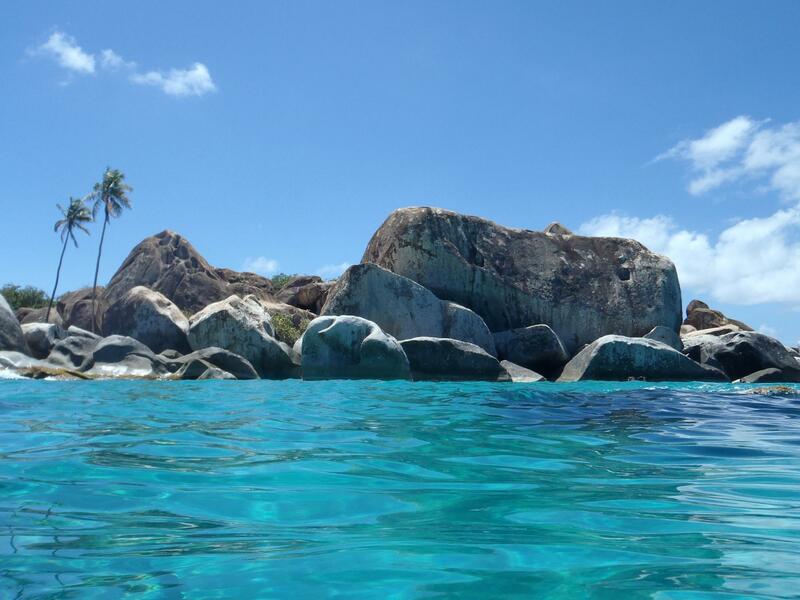 You’ll love the massive boulders, curving beach, and palm trees at DEVIL’S BAY. 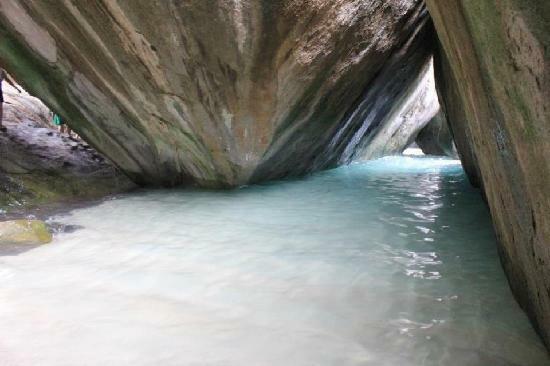 Floating on these transparent turquoise waters ~ as you snorkel around the boulders ~ is one my favorite experiences in Virgin Gorda! Consider adding this appealing attraction to your bucket list. You can’t just park your car near this beach; you have to hike there, but it is worth it! Plan ahead and carry the minimum: sun block, water, a beach towel, and snorkel set. This beach can be crowded (but not as crowded as THE BATHS) because many tourists come over from Tortola on the 9 am ferry and return around 2 pm. This is especially true when there is a cruise ship docked in Tortola. Be smart and plan your visit for later in the afternoon. This location is a bit of heaven! 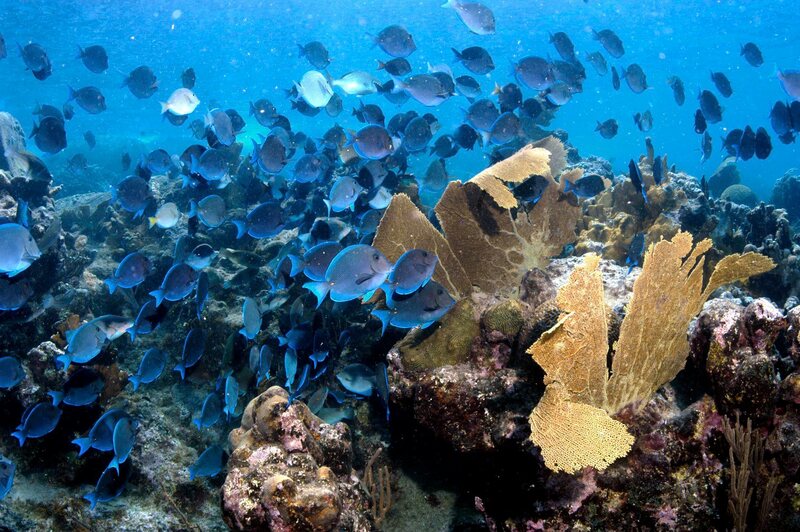 No trash, just beauty above and below the water, and you’ll feel like an angel at Devil’s Bay! 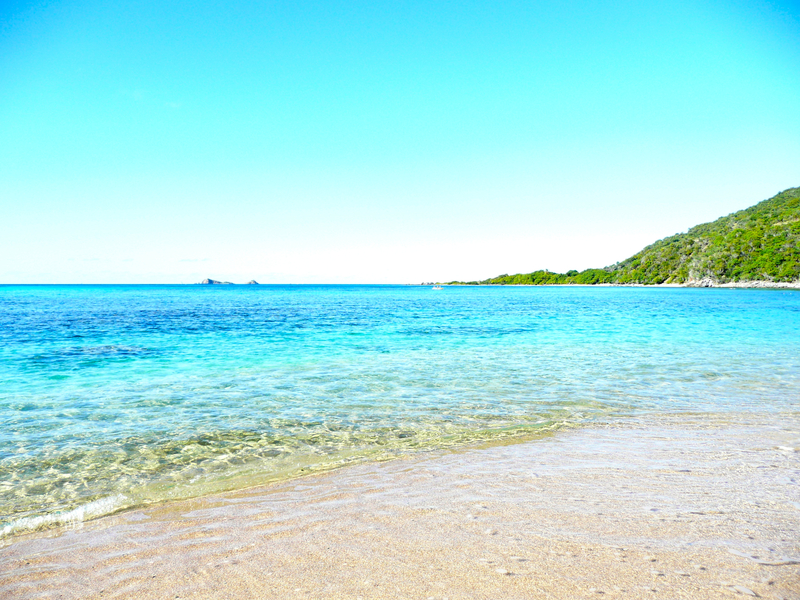 Please subscribe to my Insider’s Guide to Virgin Gorda so you can read my future posts with updates on what is happening on Virgin Gorda throughout the new year!